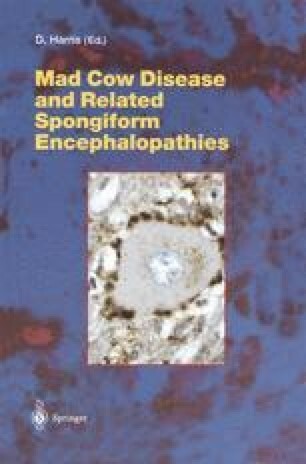 In common with other prion diseases or transmissible spongiform encephalopathies (TSEs), scrapie of sheep and bovine spongiform encephalopathy (BSE) are characterized by grey matter vacuolation and accumulation of an abnormal isoform of the host prion protein (PrP) in the central nervous system (CNS). In apparent contrast with human disease, neither neuronal loss nor gliosis are invariable features of the pathology of domestic food animal TSEs. In sheep, accumulation of abnormal PrP may also occur in the lymphoreticular and peripheral nervous systems where it may be detected within months of birth. The involvement of tissues other than CNS is influenced by dose, PrP genotype of the host and strain of TSE agent. Although many different strains of scrapie agent have been isolated in rodents following serial passage of affected sheep brain tissue, the significance of these murine strains for natural sheep scrapie, and the extent to which different sheep scrapie strains occur naturally are uncertain. Whereas the consistent vacuolar pattern in the brains of BSE-affected cattle suggests a single strain of agent, the patterns of vacuolation in sheep scrapie are highly variable and cannot be easily used to define strain. In sheep scrapie, immunohistochemistry can be used to visualize different morphological types of abnormal PrP within individual brains. These different types of PrP accumulation seem to be associated with different brain cell types and with variation in the processing of abnormal PrP. When assessed in whole brain, different patterns of PrP accumulation are helpful in distinguishing between different sheep scrapie strains and also between ovine BSE and natural sheep scrapie.